Bailleul Communal Cemetery Extension (Nord), France. Matthew was born c.1884 near Tang Co Westmeath*. 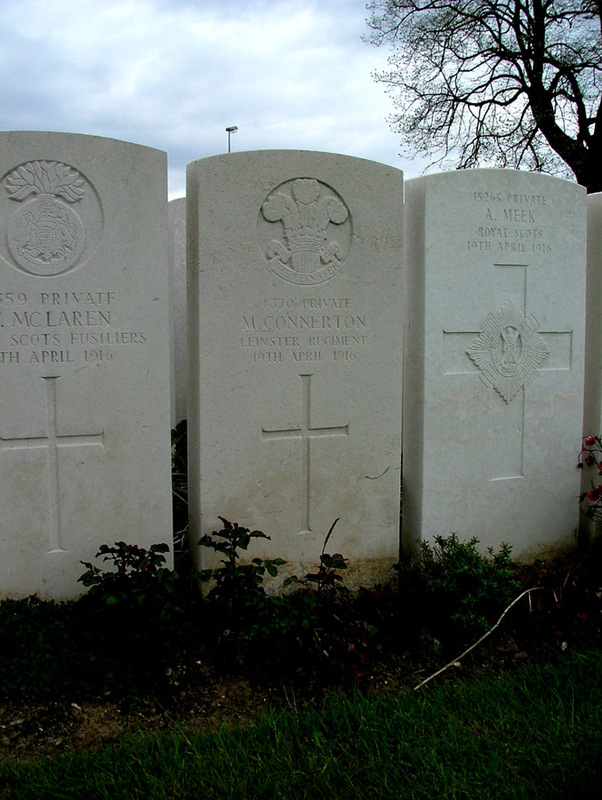 "Roll of Honour: We regret to announce the death of Private M. Connorton, a native of Lissaquill, Ballymahon. The deceased was the son of Mr. James Connorton. He served for some years in the army, and again re-enlisted, and was sent out to the front some few months ago. He was home on a short furlough before going to the front. The news of his death will be felt by his numerous friends with deep regret. We extend to his bereaved relatives our deep sympathy in their sad bereavement. - R.I.P." Son of James Connerton and Anne (née Murphy), Lissaquill, Noughaval, Tang, Co. Westmeath.